Père-Lachaise Cemetery in Paris is huge and can be confusing. Here are some tips to help make your visit most enjoyable. Père-Lachaise has thousands of graves and covers an area of more than 100 acres (44 hectares). There are hundreds of famous people buried there, and you probably have some favorites you'd like to visit. High on my list were singer Édith Piaf and mime Marcel Marceau. There are also many beautiful sculptures and plantings that also enhance the visit. Plan on spending a couple hours at Père-Lachaise and be sure to wear comfortable walking shoes. 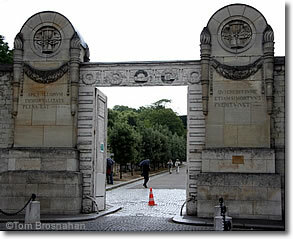 Père-Lachaise has several entrances. Most used are the Entrée Principale, on Rue du Repos, and the Porte Gambetta, on the Rue des Rondeaux. While the Entrée Principale leads you up a majestic avenue topped by the Monument aux Morts, we find that the Porte Gambetta is a better starting point for a visit—the upper areas are a bit easier to navigate, and most of the walk is downhill from there. Be sure to stop in the Columbarium (division 87). Small niches contained the cremated remains of thousands of people, including dancer Isadora Duncan, artist Max Ernst, and filmmaker Max Ophuls. The map notes the division for each famous tomb. For instance, writer Oscar Wilde is in Division 89, while singer Jim Morrison is in Division 6. You sometimes have to look for a while to find a specific tomb, since there are many people buried in any one division. But the looking itself can uncover other interesting monuments. Père-Lachaise is also quite hilly, with staircases at various points, making it sometimes challenging to interpret the contours of the map. Look for the signs that indicate street names and division numbers. If you go via the Père-Lachaise Métro station (map), you will be at the lower end of the cemetery, walking up hill. We find starting the visit at Gambetta is easier and more pleasant.